I sometimes wonder why I’m so beguiled, so utterly engrossed by the products of late Victorian engineering – the industrial tank engines, the shunting yards, the country stations, the narrow boats and traction engines. What is it about 19thC. iron and steel and steam that speaks so eloquently to my 21st century imagination? It’s not any sense of attraction to some form of arcadian nostalgia. I really don’t wear rose-tinted spectacles. I recognise that the heavy industries that fabricated the steam engines, boats or factory machines were brutal, hard and harsh places, and that working class life was full of inequality and abuses, poverty and hopelessness. So no, it’s not nostalgia. Perhaps, in the end it comes down to more prosaic things, such as my senses delighting in the animation of these mechanical wonders. The sensory overload of sight, smell, sound, taste and touch that the abstracted intricacies of a computer or smart phone circuit board could never match? Perhaps it’s the explicit directness of the mechanical and physical processes involved in making these engines move that I feel a greater kinship with than with the hidden interconnections and enclosed wizardry found in more modern machines? 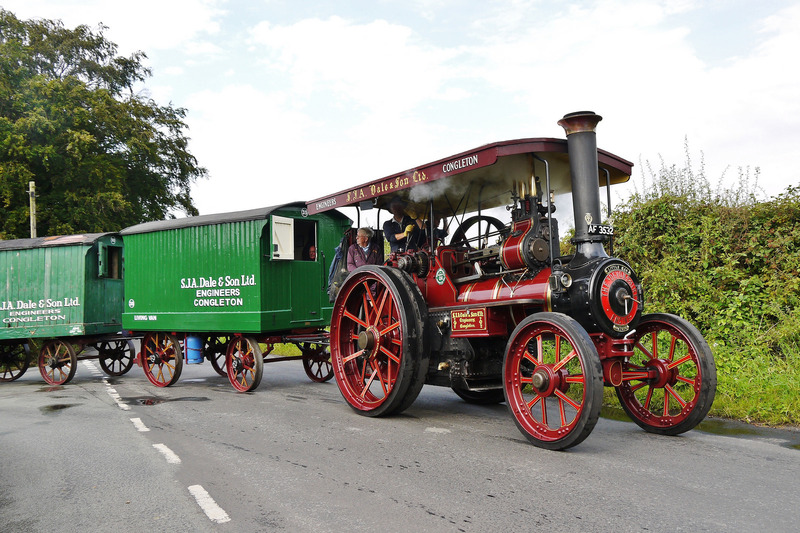 Perhaps it’s the passion and skill of the renovators and the restorers, with their utter commitment to resurrecting magnificent machines that sets my heart running? I well remember helping (mainly by staying well out the way!) two friends replace a fly wheel in a steam road roller. It was an afternoon of chains and pulleys and delicacy, of grease, and sweat and engineering knowhow. It was a humbling, inspiring afternoon and at the end of it that mug of tea was a delight to drink as we savoured a sense of satisfaction at a practical, physical achievement, and a job well done. 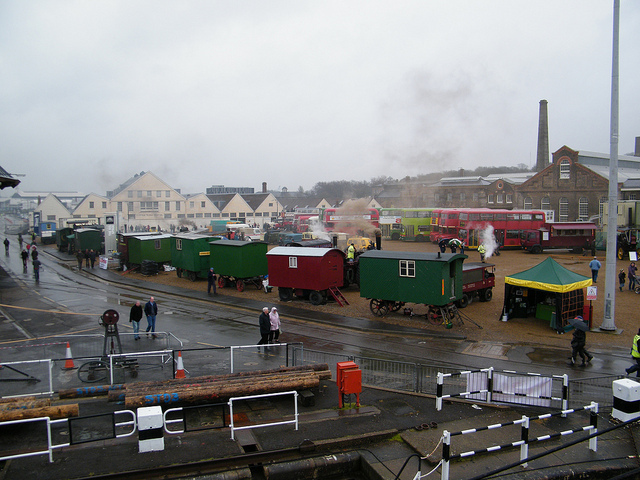 I don’t mind if it’s corrugated iron buildings, shepherd’s huts, narrow gauge railways, preservation lines, historic boat rallies, antiques sales etc. etc. I’m fascinated by them all and always eager to learn more. So as SLOWBOAT travels forward beyond its 1000th posts I suspect there’ll be many more posts celebrating the skills of the Victorian engineers and the heroic efforts of the amazing people who keep the machines going today. Baring that in mind, I promised in a previous post that I’d come back to look again at living vans. 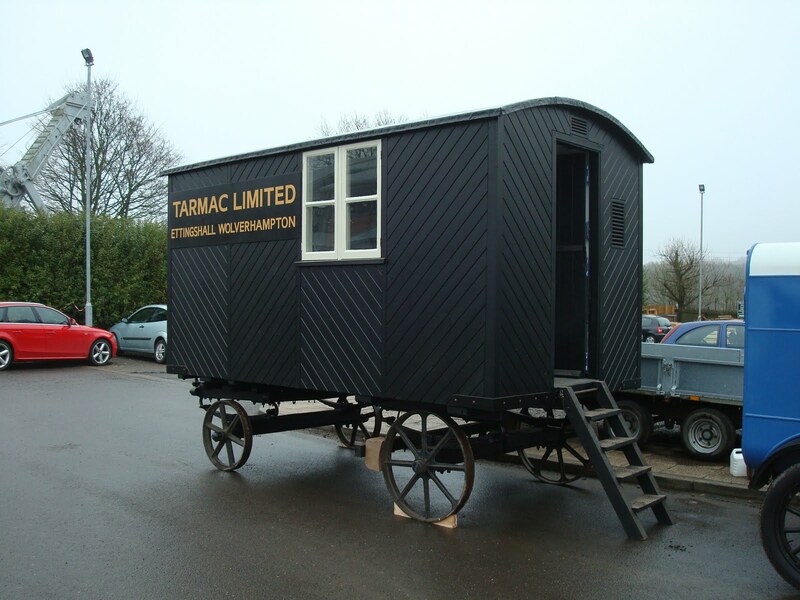 The living van, in contrast to the showman’s vans, were not primarily for living in permanently. 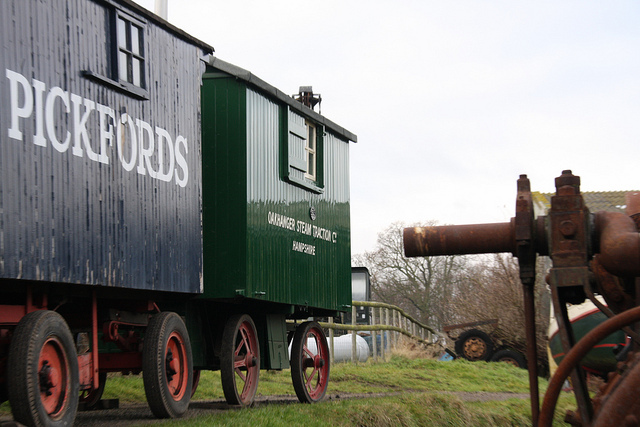 They were more a means of allowing the ‘heavy horse’ crews to billet down when working further than commuting distance from home, with the van acting at various times as a canteen, dormitory, shelter, kitchen, storeroom and office wherever the traction engine happened to be working. This van doesn’t have a door in the front end as was often the case, enabling easy access from the engine, but does have the verandah that provided space for the crew to sit close to those working the engine. I wonder if there’s a collective noun for a group of living vans, a ‘bevvy’ or ‘brew’ perhaps? 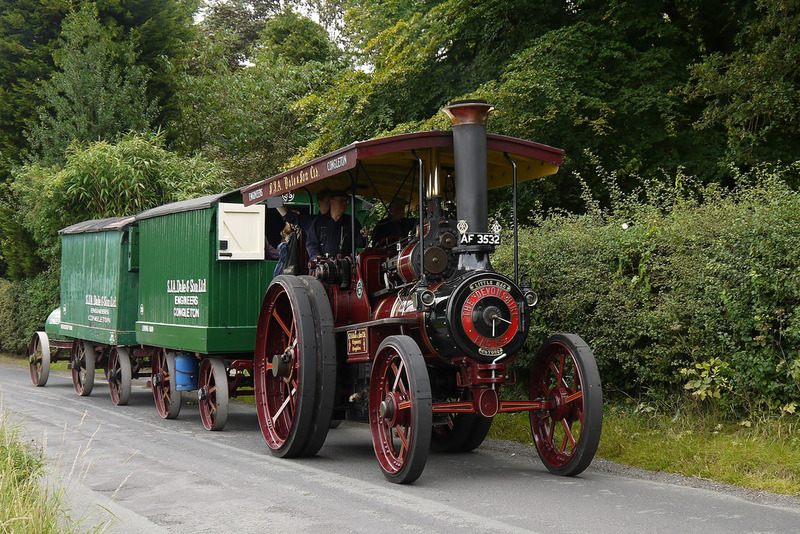 Another Burrell, this time a 5nhp Devonshire Traction Engine No.2950 “Little Mac” built 1907 and hauling what would have been a usual ‘train’ of living vans and water carrier. 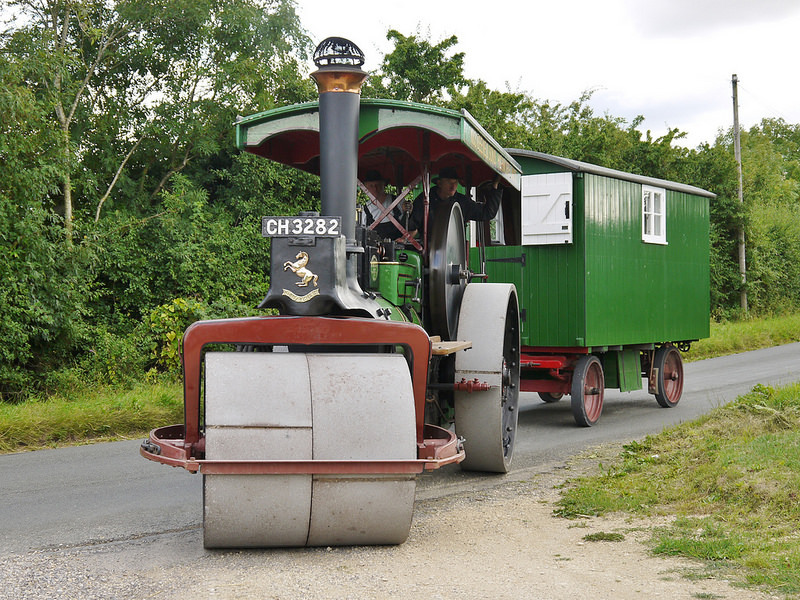 A second view of ‘Little Mac’ and the same ‘road train’. 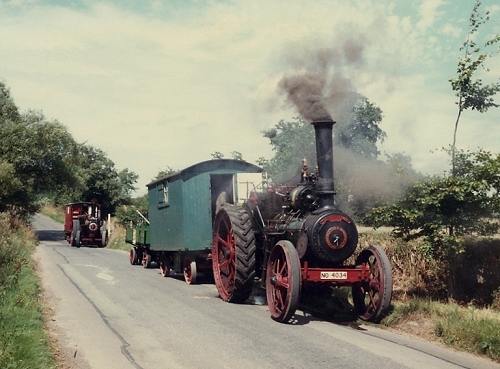 A Marshall roller “Hilda” with a Marshall badged living van in tow. 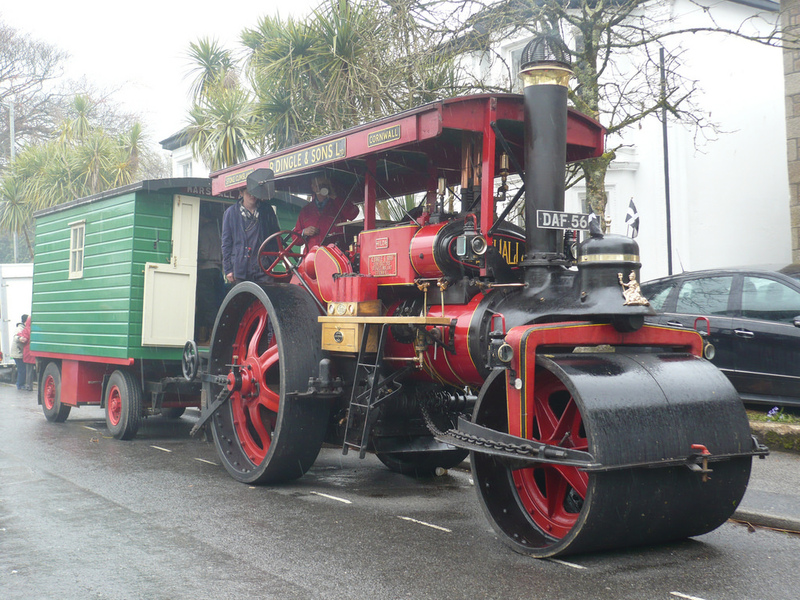 Note the used of pneumatic wheels instead of the earlier, rubber covered cast iron wheels. 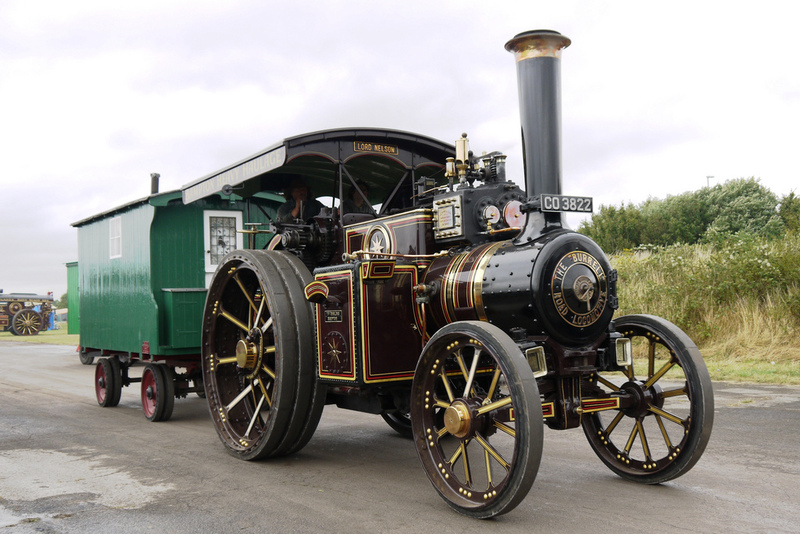 A 1904 Aveling & Porter 10 Ton Steam Roller No. 5590 “Maid Marion”. Thank you for these. 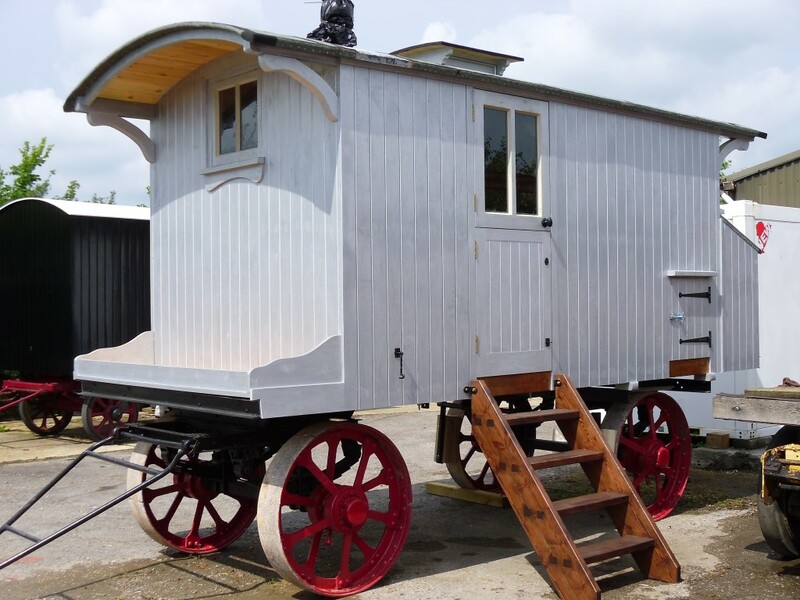 My dad and his father used to stay in one of the living vans of Bomford and Evershed while they were roadmending in Oxfordshire. I got to see inside one in use some years later and was fascinated by the little stove and cosiness, although I don’t suppose they were the ideal place to climb into after a hard and grimy day of tarmac and rolling.